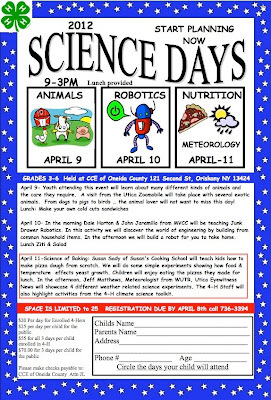 I'm very happy to be taking part in Cooperative Extension of Oneida County's Science Days -April 11, 2012. 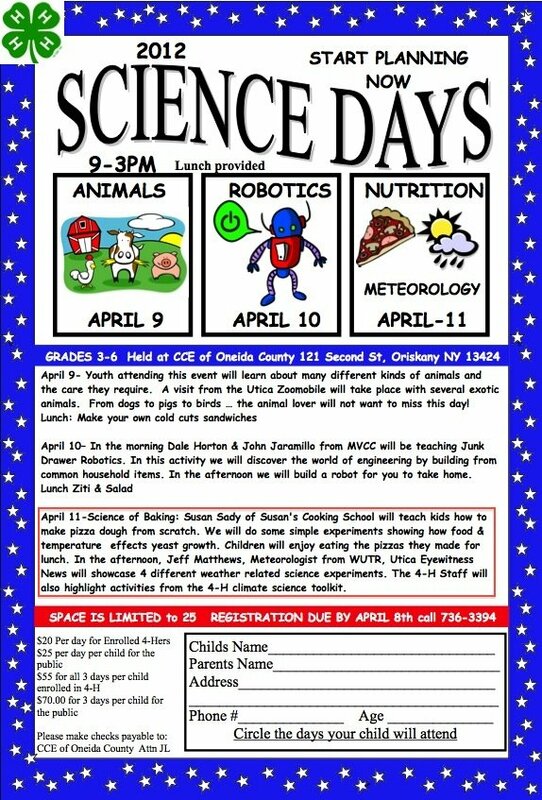 I will be teaching kids about how yeast works and what we can do to help it grow and flourish in our pizza dough. After making their own dough, the kids will get to make a variety of pizzas and have them for lunch! One of the reasons that I love cooking and baking is my interest in science. My first college degree was in Biology (UNLV) and I thought that working in a laboratory would be the most awesome job ever. Well, I realized after several years that my favorite laboratory was the kitchen. I continued to conduct experiments of the culinary variety after leaving the less edible world of the science laboratory (mostly in water treatment) and opening our restaurant, Polonaise and later, Susan's Cooking School. I keep a log of my experiments (recipes and methods) and make notes of what works and what doesn't. It really is more fun than working with hydrochloric acid. Yeast doughs are among the most complicated foods to make even though the ingredients can be quite simple. The pizza dough that I will be teaching the kids how to make at Science Days, has only six ingredients, but the complexity of how those ingredients interact with each other and the environment in which the dough is made in, is quite amazing. Transforming simple ingredients into yeast breads or pizza is the best kind of experimentation ever! Yeast dough is definitely complex!! Agree very much. Can it be understood somehow then?? Like how it works and doesn't work? There is quite a bit of info on my Pizza Dough FAQs page and my How long does it take dough to rise? page. You may find both posts helpful.